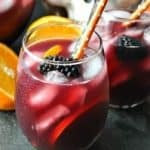 This Hallowine Sangria is a perfect spooky adult beverage for your Halloween party! Don't forget to allow plenty of time for the beverage to chill before your party (it's a great prep-ahead solution)! Wait to stir in the club soda, fruit, and ice just before serving. You don't want the ice to water down the sangria in advance. While I love how "spooky" the red wine looks, you can also make this sangria with white wine. Just make sure that you use orange and black fruit for that fun Halloween theme!